Turntables come and go. Many are excellent when launched, but slowly fade away into mediocrity as the years pass. Others endure however, and perhaps that is a measure of their greatness? Into that category, you’d have to put the likes of Linn’s Sondek LP12, Technics’ SL-1200, SME’s Model 30, Garrard’s 301/401, Rega’s Planar 3 and of course Michell’s legendary GyroDec. And by extension I would include the latter’s bigger, younger and better brother, the Orbe. The Michell Orbe has always been substantially better than the product upon which it is based, but it is of course far less iconic. It lacks the Gyro’s startling sci-fi styling and the visual appeal of those rotating gold-plated brass weights suspended beneath the platter. In its place is that 60mm slab of black carbon-loaded acrylic; you’d never call it handsome but it’s the single most important factor in elevating the sound from excellent (Gyro) to superlative (Orbe). You can hear the difference for yourself if you’ve got a GyroDec nearby; swap the platters and listen. Suddenly the Orbe seems a little less substantial, a touch more speed-unstable, and tonally it becomes a little brighter and edgier. The bigger 5kg platter has a dramatic effect on the Gyro, then. It’s more than you’d expect, and serves as an effective upgrade should you wish to denude it of its lovely, iconic spinning weights. But the Orbe doesn’t stop there; the 8kg sandblasted aluminium chassis is coated with a black, tacky, damping compound; again this mod can be done to the Gyro for a modest fee (and it’s a worthwhile one), but again it seems to have more of a cumulative effect on the Orbe. Finally, the deck’s subchassis stands on an additional, bottom plinth – or on the Spyder Edition version (sans acrylic base), there’s an additional skeletal base for the Orbe’s chassis to sit on. These three mods – base, chassis and platter, comprise the main tweaks. Then the Orbe also gets an improved version of the GyroDec motor with tacho feedback speed sensing built-in, housed in a larger case and with an Orbe Controller NC motor power supply. In the olden days the Orbe was further distinguished by its motor not being mounted on the base, but this practice has long since ceased – pulling the Gyro just a touch closer in performance terms. Finally, the Orbe has a better, stronger clamping system with a special spindle which practically bullies the record into submission! Other aspects are retained; its classic three-point suspension is clever but fiddly to get working absolutely right. Many owners don’t know how to properly fettle it and end up with the turntable sounding a little lacklustre and laboured, something it should never do. The tip here is to start off with the Orbe (or Gyro) on a totally level surface, and to not use the suspension’s built-in height adjusters. Another tip is to remove the spring covers (which resonate slightly, sullying the sound). Finally, if you don’t have the SE version – take that huge acrylic dustcover off, it ruins the sound! Unhindered, with a carefully dressed arm lead, the suspension should bounce at 2-3Hz, evenly up and down. The bearing is the standard, excellent GyroDec inverted oil-pumping bearing – best run (in my experience) with Redline Ester Synthetic 5-30W motor oil. As any Michell fan knows, the finish is superb, better even than you’d expect at this highish price. Sonically, I still have not heard many turntables that comprehensively better the Orbe, at any price. Within months of its release in 1994, Abbey Road Studios reputedly bought three of these £2,000 decks for quality control work – and you can easily hear why. It’s a very neutral turntable that doesn’t draw attention to itself, but it’s not one of those thin sounding, forensic, fussy sort of decks with oodles of detail spewing forth. Rather the Orbe has a lovely, relaxed, tonally slightly warm sound. It’s not a rich warm bloom, rather it errs subtly to the sweet side of neutral, and this happens to compliment the two tonearms it tends to be used with – the Rega RB300 (and derivatives) and the SME Series V (and derivatives). A well set-up Orbe with a decent tonearm gives a master-tape like sound; you get that trademark Michell cathedral-like soundstage (it’s wonderfully wide, just like open reel), and the tonal balance is seamless and smooth, with extended bass and a spacious, airy treble. Again, it’s neutral and controlled, with a no-nonsense feel. Rather less than its cruder sounding sibling, the Orbe simply doesn’t impose its character on the proceedings. Music has a natural and enjoyable rhythmic flow, and dynamics are strong, falling back in that inky blackness that high end vinyl does so well. Of course, the deck isn’t perfect. There’s a slight sense of looseness to the low bass; it doesn’t stop and start like a flashing LED as the best direct drive decks do, or even the likes of the Roksan Xerxes; it’s still tighter than the Linn, though. Spatially it’s one of the widest and most expansive sounding decks you’ll ever hear left to right, and has wonderfully well proportioned imaging within. However, the Orbe doesn’t hang music as far back as, say, an SME Model 10; even if it’s pretty good by GyroDec or LP12 standards. What I really love about the Orbe is that it’s so great at the price. I regularly encounter £10,000 turntables that aren’t really that much better than the Orbe, if at all. It’s easily on a par with every £5,000 deck I’ve heard, yet costs far less. It’s the same point you could make about the Gyro; one has to wonder why Michell has barely put its prices up in the past couple of decades?Overall then, this is a brilliant ‘affordable high end’ turntable; hook it up to a half-decent arm and cartridge and you’ll struggle to hear vinyl done better. Beautiful, reliable, affordable and with brilliant sound for its price point, what’s not to love? 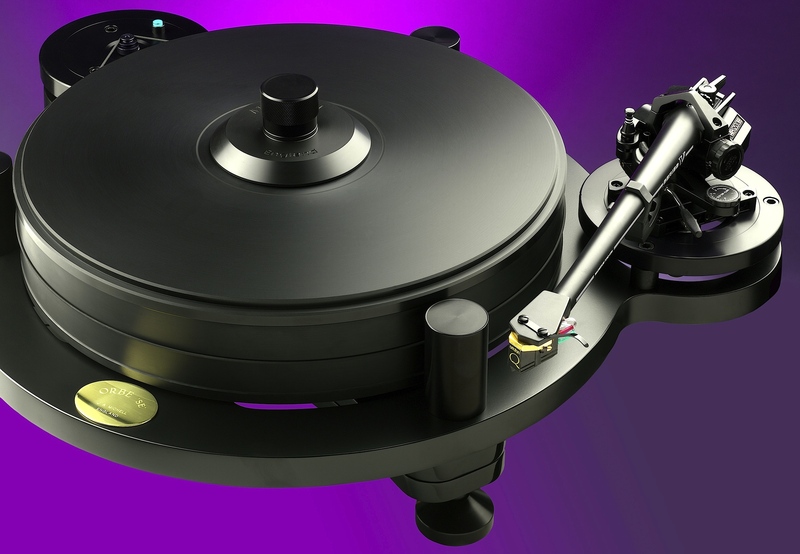 The Orbe SE is stupendous turntable and could easily be a final destination for many its that good. I’ve compared it to an AVID ACUTUS (which I now own) and to be honest it was a close run thing with the AVID only beating the Orbe outright in micro-dynamics, the law of diminishing returns certainly applies here. To offer so much of what high end gives you in a sub £5000 turntable makes it an absolute steal.